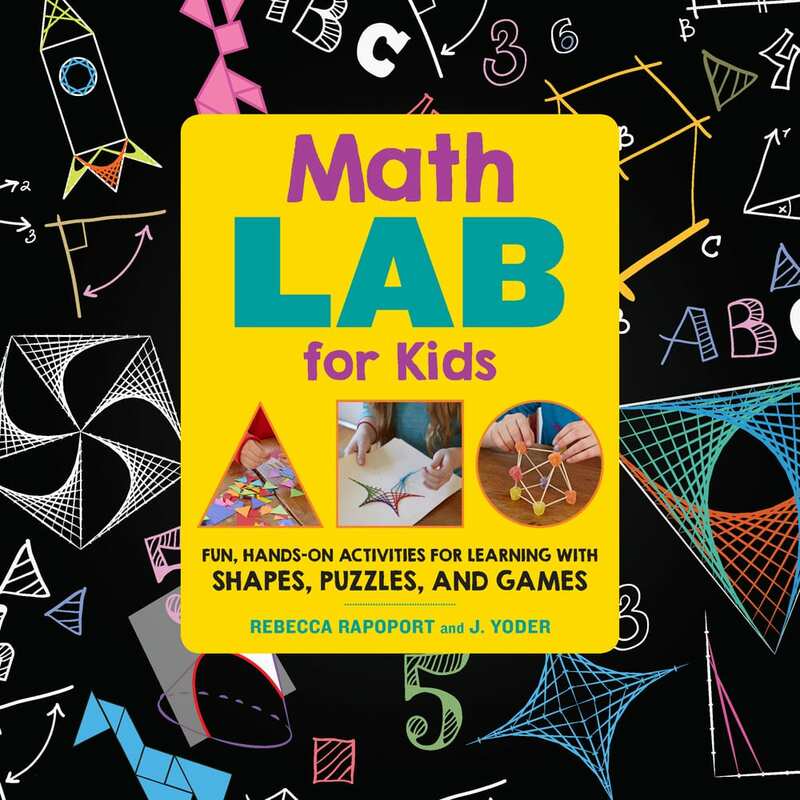 If you are looking to build your child’s math literacy or undertake some fun, engaging math activities at home, I would recommend getting Math Lab for Kids written by Rebecca Rapoport and J.A. Yoder. This book is not about doing sheets of math problems. Instead, children learn about math by drawing and building shapes, solving puzzles and playing math games. Both authors have a great deal of passion for math. 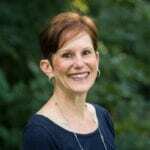 Rebecca Rapoport holds degrees in mathematics from Harvard University and Michigan State and is currently developing and teaching innovative math curricula at Boston-area schools. J.A. Yoder holds a degree in computer science from Caltech and is an educator and engineer who has a lifetime love of puzzles and patterns. 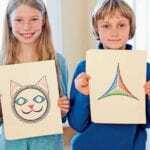 Math Lab for Kids is intended for kids from first through fifth grade. The book uses a fun, hands-on approach to learning math and is comprised of math-related puzzles, games, and activities. There are nine chapters of content that focus on exploring geometry, developing spatial learning, and building logic skills through experimentation. 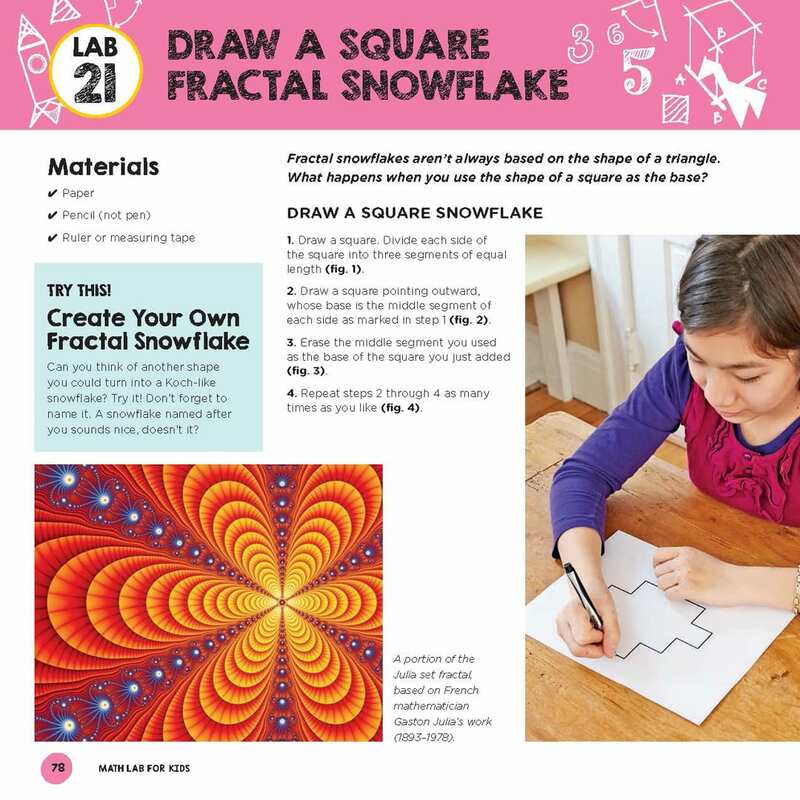 Each chapter introduces a specific topic such as topology (the study of shapes), fractals (a shape that is similar to itself no matter how far you zoom in on one particular part), tangrams (a puzzle that uses the same seven pieces to create different shapes), and more. There are a number of labs presented in each chapter, and the authors include a list of the materials needed (most are household items you already have) and clear, step-by-step instructions with pictures. Experimentation is a key component of this book and Rebecca said, “If you take nothing else away from this book, learning to just try something, anything, and see what develops is a great skill for math, science, engineering, writing, and, well, life!” I could not agree more with Rebecca! The book’s publisher was kind enough to send me a copy to review, and I was excited to test it out with my younger daughter. As the parent who was directing the activities, I found the book to be instructive and easy to follow. I also thought the book took a playful approach to the math projects which my daughter appreciated. If you have a reluctant math student, I think this book is a perfect way to get them to work through math-related projects in a low-key and enjoyable way. The authors of the book say “Mathematicians play” and I agree that the projects in this book are probably different than the math students do in school. Here, children can think like a mathematician and experiment and see what happens. My daughter was a bit skeptical when I said we were going to do math games and projects; however, when we finished the activities she admitted it was fun. We used candy for many of the activities which she enjoyed. Over the course of a few days, my daughter built prisms and pyramids, challenged herself to make a dodecahedron (12-sided shape), drew parabolas, transformed shapes with toothpicks, and more. Playing the math game Nim was a great way to practice problem-solving strategies. Overall, the experience was positive for my daughter and we enjoyed doing math activities and games together. 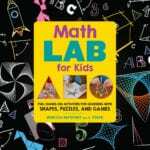 You can get Math Lab for Kids at your local library or from Amazon and Barnes & Noble. There are also some great online resources that go along with the book at mathlabforkids.com.